Most of my reviews found here are about books and movies, but occasionally I run across something else that compels me to tell others about it and share whatever insight I may have. I’m talking about Synetic Theater‘s current show King Arthur. Simply put, it’s one of the most incredible shows I’ve ever seen. …and it taught me a lot about filmmaking (more about that below). For starters, Synetic is a “physical theater,” and while I don’t know exactly what that means it’s quite clear that this is not theater as you typically know it. In the case of King Arthur, there is not a single word spoken in the entire show. It’s a dramatic visual experience unlike anything I’ve seen before. … Come to think of it, most of the mind-blowing performances I’ve seen never say a word –anybody seen Cirque du Soleil or Stomp? Since there are no words, they have to rely on strong visuals and creative storytelling to get the message across. They definitely employed some tricks that are amazingly simple, yet unfamiliar to most theater goers. The actors themselves probably have substantially different resumes than your average Broadway star. A pretty face and a great accent aren’t good enough here. These people have to be in mad physical shape! I asked a couple of them after the show if they had dance backgrounds or what, and one of the co-stars simply said, “football.” It’s a physically demanding show and they make it look easy. Oh! and did I mention that the whole show is performed on a water stage?! 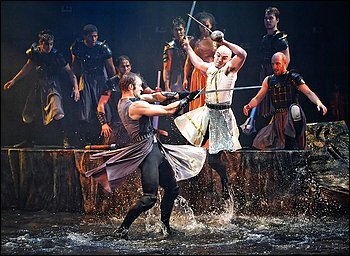 As if lights, sound, choreographed dancing and fighting weren’t enough, they do it all ankle deep water. It’s a remarkably unique experience, and it marks the first time that a show has engaged my sense of touch. For those like Lacey and I who sat in the splash zone, you’ll want to bring a poncho. …for realz. Lastly, I found myself wishing I knew more about King Arthur legends. I feel like I would have appreciated the show more and would have likely noticed more subtleties in the plot. Anyway, enough talking; check out the trailer and then do yourself a favor and go see one of the last four shows before it’s too late. P.S. I’ve included my observations about the show below. I would recommend that you go see it before reading any further. I wouldn’t want to spoil anything for you. Within the first 10 minutes of the show I pretty much decided that I will make a point to see all of the shows at Synetic, and the reason is because they have a solid understanding of visual storytelling. Filmmakers should really take note. Learning to communicate and tell a story visually is the very essence of film! As a photographer who ultimately wants to make films, the more I can learn about this the better I’ll be. I’m sure there is much I can learn from these guys. Props. The stage was extremely well thought out. They transformed it in so many ways using primarily a few pie-shape “rocks.” I applaud the creativity and resourcefulness here. However, I’m a stickler for details. Some of the props seemed a little “wiggly.” Some of the larger background pieces looked a little funny when they were being moved into position. I couldn’t help but imagine the person hiding behind it trying not to be seen, and that pulled me out of the show at a couple points. Also, I was sitting in the front row so those halfway back may not have even noticed. The water stage was a truly unique experience. They did a good job of using it to embellish the story without making it some sort of gag. In fact, I think it would still be an amazing show without water. I personally thought there was a little lag in the middle where the water stage wasn’t necessary, but they picked up the pace shortly thereafter and had me captivated by it again. It really makes the show a sensory experience, not just the usual sight-and-sound combo. The lighting was phenomenal! Many of the scenes are lit primarily with the actors holding flashlights. It’s brilliant!! Not only does it just look awesome, but it gives the actors a tool that is usually reserved for the stage director; they use the light to let the audience know where to look and what’s going on. There was one scene in particular where Arthur was holding two flashlights; he flipped one around to point at what he was looking at while the other one pointed to his face. It was so simple, yet such a terrific example of anticipation, action, and reaction –those are the very nuts and bolts of visual storytelling! I’d love to hear what you think! Go check it out and then let’s talk. This entry was posted in Films by Stephen Elliot. Bookmark the permalink. I agree with your review. I loved the show. Of course, I am prejudiced as my son is one of the performers…or was, since yesterday was the last day. Well then give your son a big high five for me!! Thanks for taking the time to read my review.